Hello, October! We're in an autumn state of mind here today as we begin the Feels Like Fall blog hop! 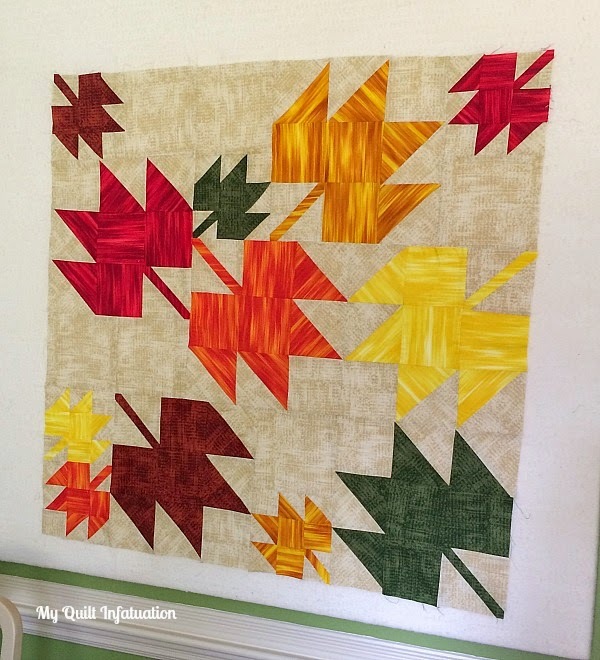 Today Kelly from My Quilt Infatuation is sharing her leaf quilt, glowing with maple leaves in warm hues. Kelly paired prints from the Harvest Song collection with Fleurish stripes to make this quilt. Enjoy her tutorial and then find out at the bottom of the post how you can win a bundle of Harvest Song prints! Hey there! 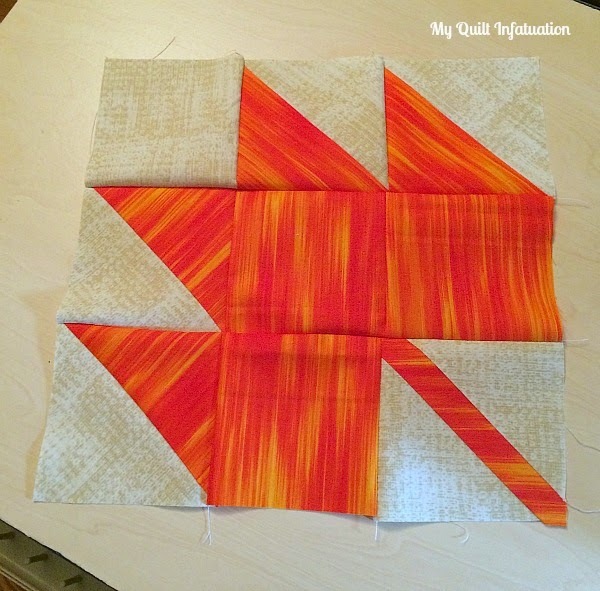 I'm Kelly, and I blog regularly at My Quilt Infatuation. If you're anything like me, you can't wait for the hot, muggy days of summer to give way to the crisp, cool weather of autumn. Fall is my very favorite season. I love fall weather, the sweaters and boots I get to wear, goodies made with apples and pumpkins, and most of all, the gorgeous colors found everywhere in nature. Those beautiful colors served as the inspiration for this table topper (or wall hanging) made with scattered maple leaf blocks. For this project, I used a mix of the Fleurish and Harvest Song fabric lines from Benartex. They have a beautifully textured look that are just perfect for these leaves. 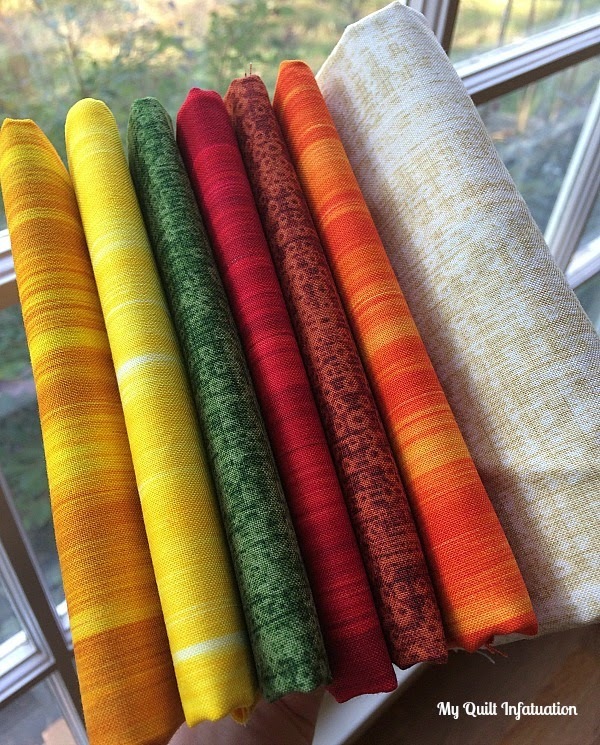 I really like the warm colors of both lines, but I absolutely adore the streaked look of the Fleurish fabrics. It gives the leaves so much depth. This project made from a mix of 12 inch maple leaf blocks, 6 inch maple leaf blocks, and 6 inch "blank" blocks, which help create the random, scattered look. You will be making one 12 inch (finished) maple leaf block, and one six inch (finished) maple leaf block from each print. 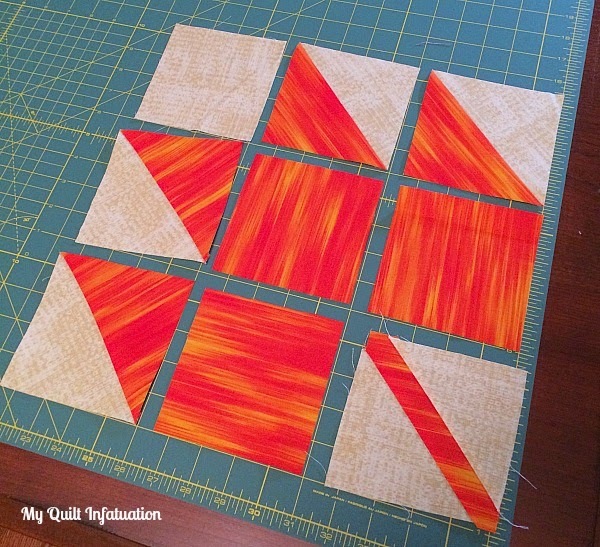 Begin by making all of the HST's for your 12 inch maple leaf blocks using the four at a time method. I find that making all of the HST's for the blocks is much faster than doing them one block at a time, and I'm all for anything that saves time! Once you get these HST's finished, next we need to make the stem pieces for each maple leaf. To make these, we will be sewing corner to corner. I know there are other ways to make these, but to me this is the easiest and most accurate way. 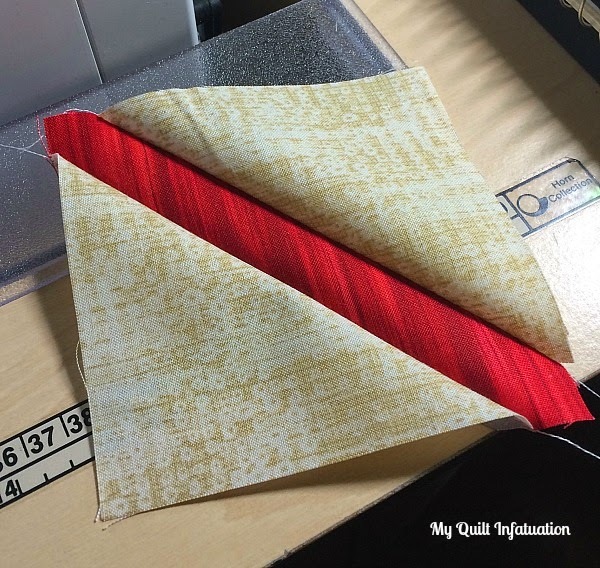 Align one 4" background square with the corner of one 4.5" print square and sew corner to corner. You may choose to draw a diagonal line as a guide, or just use a piece of painter's tape on your machine/table to keep everything straight. 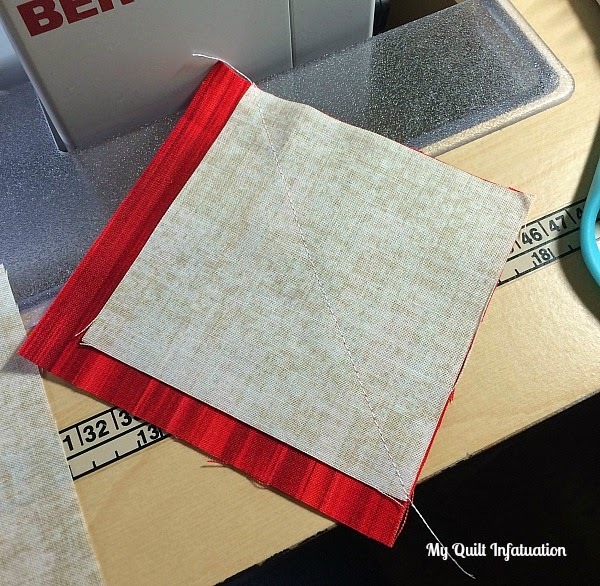 Trim away the excess to 1/4" and repeat by aligning another 4" background square with the opposite corner. Trim again, open it up, and voila! A cute little maple leaf stem! I always press mine when I finish all of them, so don't mind the un-pressed photo! Now that you have all of the components for the 12" blocks made, it's time to assemble the blocks! Just arrange them into the maple leaf shape and sew together as you would a regular nine patch. Repeat to make all six of your 12" maple leaf blocks. Then it's time to move onto the six inch blocks! The process is exactly the same of course, but the pieces are just smaller! To make the HST's pair the remaining 4" background squares with the remaining 4 inch print squares. 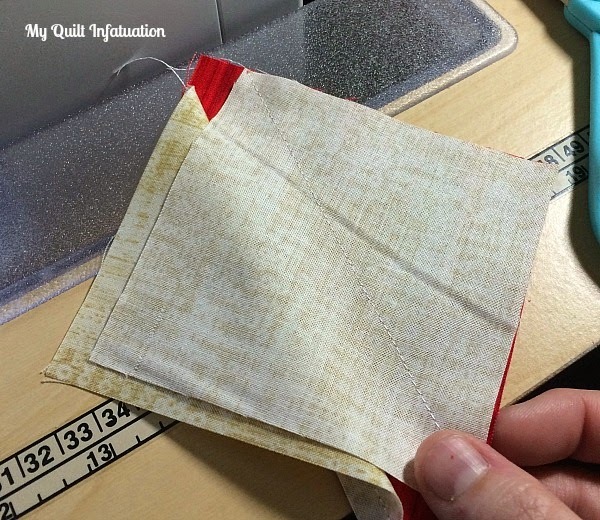 Sew around, cut diagonally, press open, and trim your HST's to 2.5 inches if necessary. To make the small stem pieces, align 2" background squares with the corner of one 2.5" print square. Sew corner to corner with the same method above. Assemble the six inch blocks in the same manner as the 12 inch blocks. You should have one six inch, and one 12 inch block from each of your prints. Now onto the fun part- laying out the blocks! There are tons of different ways to arrange these blocks, and it's so much fun playing with the direction of the leaves and color layout. There is no wrong way! Don't forget your "blanks." You'll need those to fill your quilt out, and to create some great negative space between those leaves. 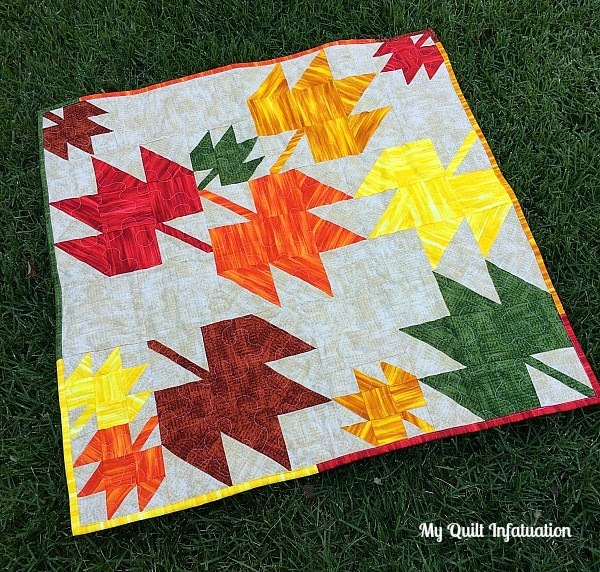 The really neat part about this quilt, is that there aren't regular rows of leaves, and you can have fun arranging the direction of the leaves to create different looks! 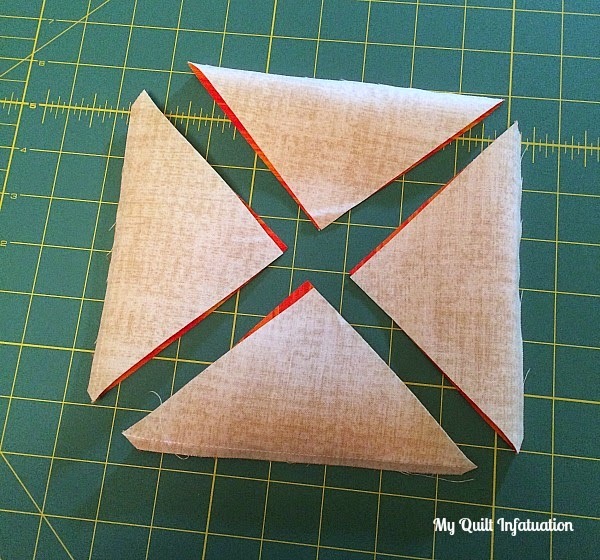 Just lay your blocks and "blanks" out however you choose and sew them together in sections. My quilt is put together in five different sections. 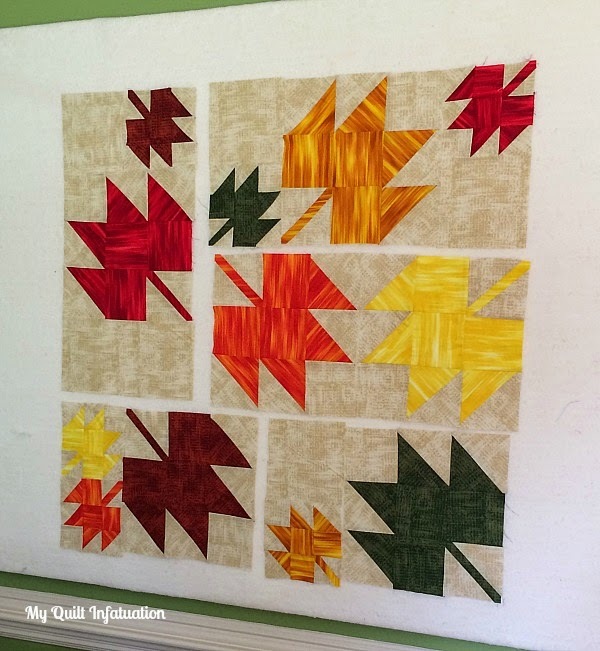 Sew the sections together, and you've got an awesomely modern Scattered Maple Leaves quilt! 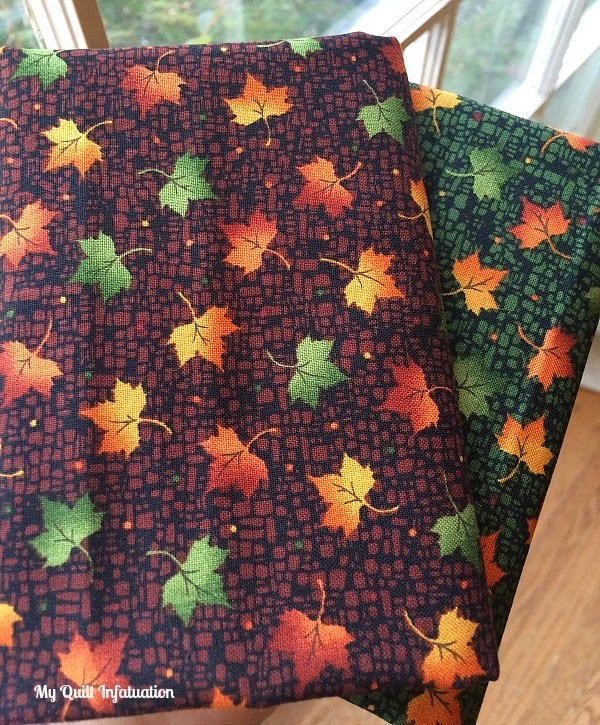 For the backing, I chose to piece some wide stripes of some of the fabrics from the Harvest Song line, including these two cute leaf prints, and of course I can't resist a scrappy binding! Scattered Maple Leaves measures 36" square, so it's the perfect size to spruce up a fall table, or to hang on the wall! Here in Tennessee it isn't quite feeling like fall yet, but this project is certainly making me do some wishful thinking! I hope you enjoyed this tutorial as much as I enjoyed creating it! 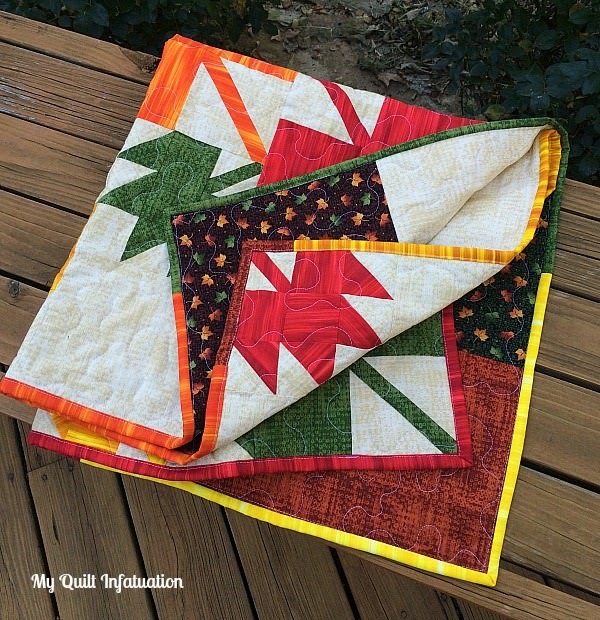 I hope you'll pop on over and visit me at my blog home, My Quilt Infatuation to check out some of my other quilty projects! Thanks Kelly! Gorgeous quilt! Head over to Kelly's blog and enter to win a fat quarter bundle of Harvest Song so you can get in the fall spirit! Be sure to check out the tutorials and enter the giveaways each day! This is so beautiful. I have always appliqued the stem down but I love the way she did hers. I have never seen it done this way. I am definitely going to try this the next time. Great tutorial and I love the way you can play with the placement of the blocks!! This one's a keeper!!!! Really nice! Love the textured look of the leaves and background, and the scattered arrrangement of the leaves. Definitely going on my to-do list!! Fabulous design and tips.Sure I `ll try to do the steam i your way.You caught the Fall season!! Yes it is fall and this tutorials is just the right color decor. Thank you once again for another great idea and sharing with all of us. I love your choice of colors, just right for fall. The colours in the leaves are beautiful. Very fall. Lovely quick quilt in the fall colors. I can wait for the seasons to change (like they ask me! ), but the colors are always nice. Not much change here, just drying up and falling off. This is my favourite maple leaf quilt that I have seen - the colours are gorgeous. Love the fabric. I am following on Bloglovin' and email. Great block. I would like to use it with some Holly Taylor fabrics I have! Thank you for the tutorial!! So cute and so fall! I need to make some seasonal things to decorate with! Your quilt looks like leaves falling. Thanks for the tutorial. Love the colors. Thanks for the chance. 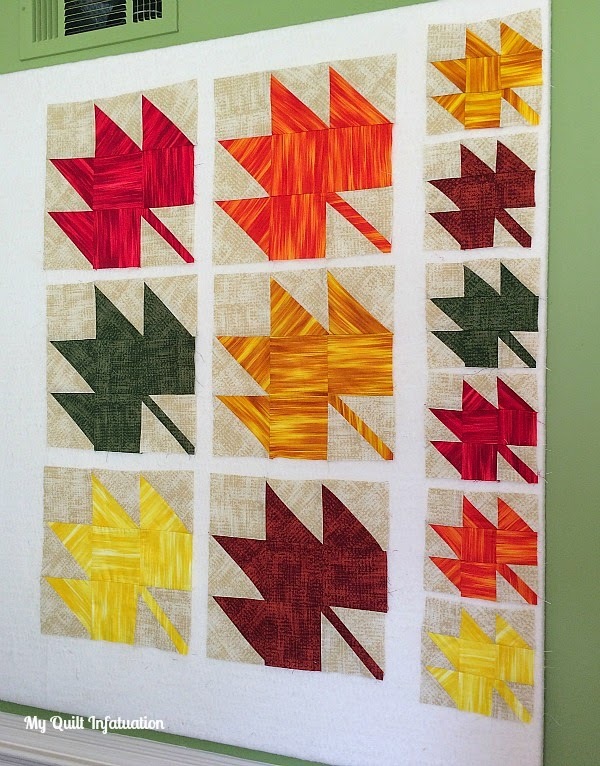 I love this quilt especially with those popping yellows and after you changed the orientation of the blocks to look like falling leaves! This is definitely on my to do list. Lovely effect of both lines on those leaves. Thanks for the tute! It is perfect for autumn. not sure if you received the first. 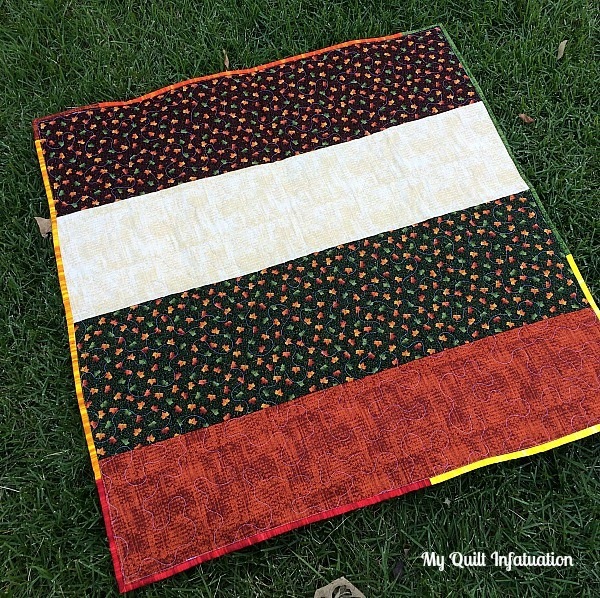 I follow you by email and love your tut and your small quilt is gorgeous. Love the colors and shading in the fabrics in this quilt. 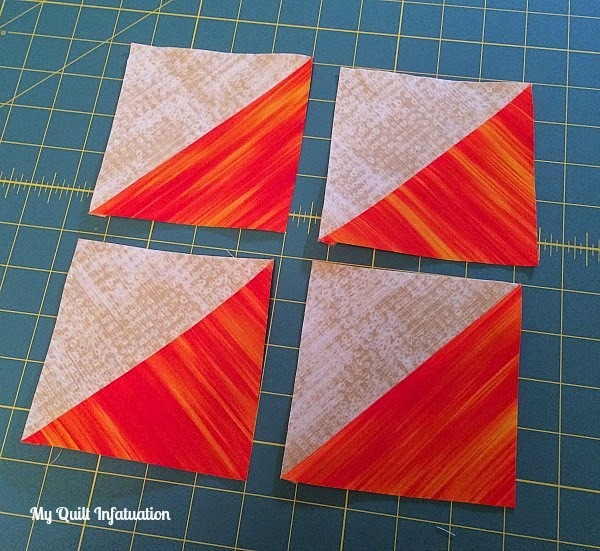 I like the choice for the backing and how she used different colors for the binding. Lovely. Beautiful, rich fall colors in this quilt. Very pretty. Thank you Kelly for the great tutorial. Great pattern! Love the colors and the two different sizes of leaves. Nothing says Fall better than leaves. Fabulous colors and pattern, I would love to make one too!! I love the tutorial, it's really shows the detail of the method to make the blocks. Thanks for your time and sharing this with us and with a giveaway is so generous.